Christmas is often seen as a time to spend with family - but what if you don't have one? Poet Lemn Sissay, who grew up in care, is striving to make sure those in the system don't spend Christmas Day alone. The writer, from Greater Manchester, whose large outdoor works adorn the walls and pavements of the city, hopes his annual Christmas Dinner event helps create positive memories of the festive period for his guests. He says it can be a difficult time for those who have spent time in the care system. "I remember getting a clock radio when I was in the children's homes at Christmas and it wasn't working and it just broke me," he says. "Not because it wasn't working, but because somebody didn't care enough. It just signified everything that was wrong with what had happened to me." 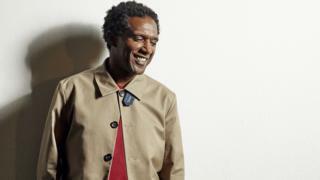 Sissay, who was in care as a baby and between the ages of 12 and 18, has seen his idea snowball from a single event in 2013 to 12 taking place across the country this year. He said he had been inspired by a Christmas dinner he had seen in London run by the Tope Project, a volunteer-run scheme to combat loneliness for those who have been in care. "I wanted this to be in Manchester," he explains. "We began with nothing, except our imaginations and our belief in ourselves - and it happened." This year, there will be dinners in Birmingham, Canterbury, East Sussex, Hackney, Islington, Leeds, Manchester, Oxford, Richmond, Sheffield, Stockport and the Wirral, serving roughly 500 people. Each is organised by local volunteers who are given a guidebook produced by the poet to help them plan the day. "Christmas Day can be a very difficult day for young care-leavers," Sissay says. "For some of us, going home for Christmas is a pain and there's arguments and dysfunction. "But there are young people who have nowhere to go and who feel on their own on that day and who feel a greater sense of loss. "It's about giving them a smile and making them know that they matter on that day." This year, the Lemn Sissay Foundation has been set up as a registered charity, which secures the future of the event. The award-winning author describes it as his "own personal legacy" and says each dinner tries to make every individual feel special. "It's all about the detail - the cards written to that person, the presents chosen for that person so they have that joy and surprise and the thing they'd always wanted, like a pair of football boots," he says. "It's about spreading that joy." Image caption Mike Morris first went to the Christmas Dinner last year and described it as "very touching"
Mike Morris, who was in care from the age of 13, attended the Manchester Christmas Dinner in 2016 after being introduced to it by the Greater Manchester Youth Network. The 18-year-old said he had thought about being alone and "really depressed" at Christmas and although he had his doubts about attending the event, he enjoyed the day. One of the most important things about the event is not feeling like a "charity case", he says. "It doesn't feel like you're being given things, it feels like you belong there. "If you go to a council or institutional thing, it'll be the cheapest things and the same chairs and tables. [But] you go in here and it's Christmas trees, decorations everywhere, everyone's having a good time. "It made you feel like people actually care and you're not as on your own as you originally thought. "If you can be with people you can relate to on Christmas Day, isn't that the whole thing about Christmas?" Emma Lewis-Kalubowila and Louise Wallwein are members of the steering group which organises the Manchester event. Emma, who works for the University of Manchester - where Sissay is chancellor - says one of her stand-out memories was of two sisters in separate care situations meeting unexpectedly at one of the events. "They'd both been nominated by people who knew they'd been spending the day on their own but hadn't realised their sibling would be attending," she says. "The year that they had Christmas Dinner with us was the first year in nine years that they'd had Christmas Day together." Louise, a poet and playwright, has been involved in the event since the start and now works mainly on the fundraising side. She says she uses her own experiences of being in care to help shape the events and there is a "rigorous examination" to ensure the day is the opposite of institutional. "The first few years out of care were very difficult and Christmas is the most difficult time. "It reminds you what you're not part of," she adds. One key aspect of this is arranging for all guests to arrive in taxis, which Manchester City Council has agreed to fund this year for the event in the city. "It isn't about feeling sorry for the people that are coming, it's about trying to give them a real pamper and a real treat," Emma says. And what will this year's Manchester guests be feasting on? "It's turkey on the menu, we're fairly traditional," she adds.